They have decided to grow their own crops in the nest. Thanks for the new thread, Mary. Had a lovely time at Glaslyn today. It was extremely hot and it was clear that the Ospreys felt the heat but both Mrs G and Aran proved what wonderful parents they are. Anyone watching the live streaming had probably noticed that the birds were suffering in the heat. But by late afternoon (5-ish) the temperature had dropped slightly thanks to a thin layer of cloud across much of the sky and the birds began to look far more comfortable. 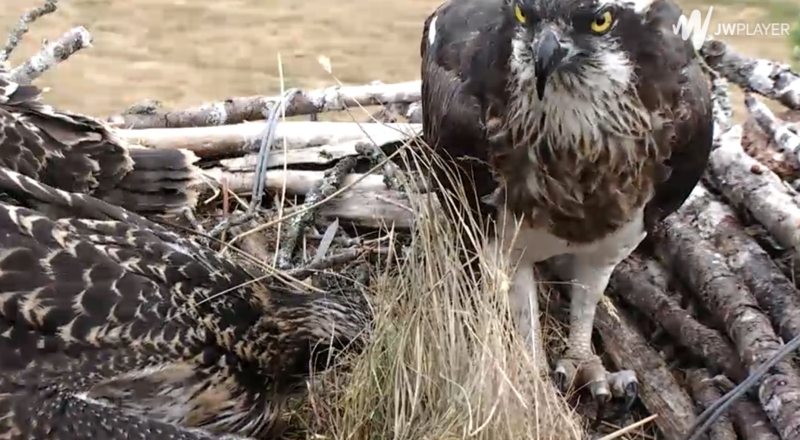 Both parents were feeding the chicks whenever Aran brought in a fish and both were shading the chicks. Aran has been bringing in some coarse fish occasionally, for instance a Brown Trout in the late afternoon. It is pure speculation but I wonder if that might be due partly to the timing of the tides with the high tides occurring around 11/12-ish and around midnight so perhaps easier for Aran to go fishing in fresh water lakes and rivers rather than fly far out to sea since the estuary is fairly dry after the tide goes out. Thank you Ann and enjoy your time there. Chicks currently resting with an adult on the perch, can't see enough to identify. Mrs G feeding chicks now. Stream very stuttery. Someone on the perch now. All present. Aran on the perch. Mrs G on the rim with the chicks who are preening.